(L-R) Alberto Benetti, John Hales and Mal Patel (API Product Manager) and seated, Stefania Benetti. 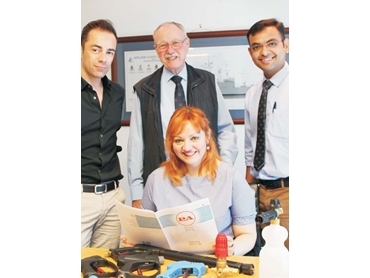 Australian Pump Industries recently had two visitors from Italian company PA to finalise an agreement on the use of their high pressure accessories. Australian Pump Industries (API) is the leading PA high pressure water blaster accessory distributor in Australia. PA’s Stefania Benetti, Sales Manager and Alberto Benetti, Administration Delegate visited Aussie Pumps’ 2.5-acre headquarters at Castle Hill in Sydney. The use of PA’s high pressure accessories up to 1,000 Bar on Aussie Pumps’ new machines being designed by API’s Chief Engineer, John Hales, was finalised at the meeting. John Hales explains that moving into the 1,000 Bar (15,000 psi) range is a logical step for Aussie Pumps. The company changed the way people thought about hydro blasters when they began building large volume runs of 500 Bar (7,300 psi) Raptors. Stefania and Alberto Benetti were visiting Australia to introduce a wide range of new accessories including unloaders, safety valves, couplings and 1,000 Bar rated spray guns. PA’s factory in Northern Italy’s Reggio Emilia area is a highly robotised facility with the most modern plant for manufacturing high pressure accessories in the world. According to Hales, the high pressure pump is the heart of any pressure cleaning system; however, the accessories, from humble couplings through to sophisticated unloaders and guns make those water based hydraulic circuits work. Australian Pump was the first company to build 500 Bar petrol, diesel and electric drive pressure cleaners in production line quantities. Hales informs that Aussie Pumps will probably start with 800 Bar (11,600 psi) machines running off 70 hp diesels to deliver 21 lpm flow, and then move on to bigger flows and higher pressures to supply to key market sectors such as mining, ship maintenance and production, or for grit blasting applications. The fastest growing pressure cleaner manufacturer in the Southern Hemisphere, Australian Pump offers free extended warranties. The company’s reputation for quality and performance has made them a major success not just in Australia but throughout export markets around the world. Aussie Pumps is ISO 9001 quality certified. Further information on the Aussie PA range of high pressure accessories is available from Australian Pump Industries on 02 8865 3500 or www.aussiepumps.com.au.